It was disappointing to hear some sycophantic leaders from the Eastern region of the contrapted Nigeria speak for their own egocentric interests rather than in favor of the well being of their impoverished and down trodden masses. They lined up some mouth watering presentations in support of the Nigerian government's demonic agenda. The organizers of the conference, the Eastern Consultative Assembly (ECA) need no pity as they wittingly disappointed the yearnings and the aspirations of the Biafran people today being Tuesday, the 27th day of February, 2018, at Enugu - Biafraland. They shamelessly spoke against the rights and deserved justice of innocent Biafrans unrelentlessly struggling for total freedom from slavery and all shades of injustices perpetrated against them by the Nigerian state. This group strangely appeared indifferent to the bewilderment of the mammoth crowd of Biafrans who thronged the conference arena, highly expectant. The organisers' speeches fell short of outright condemnation of the wickedness of the Nigerian leadership against the Biafran people who are daily being subjected to all manner of degrading and inhuman treatments. They rather proceeded to advocate for the impossible restructuring of the evil enclave called Nigeria which is in sharp contrast with the agenda of the Indigenous People of Biafra (IPOB) worldwide. Biafrans stand opposed strongly to any form of restructuring or the theory of One Nigerianism. We are clamoring tenaciously for Biafra referendum under the close supervision of unbiased International observers. It is important to state here that the position of the ECA portrays betrayal and insincerity on the part of Igbo leaders concerning the plight of their own people. The gathering today in Enugu has further revealed the incompetence of these political jobbers who parade themselves as a group representing the interests of the poor in Igbo part of Biafraland. The Eastern Consultative Assembly (ECA) is grossly incapable, fickle and unfit to lead the Igbos or being arrogated the honor of representing the people by reason of their betrayal of purpose before the teaming Biafran crowds today in Enugu. The ECA executives are a bunch of blackmailers, sycophants and hypothetical leaders who are not just working for the Nigerian government, but shamelessly scheming for their own frivolous interests, well against the overriding interests of Biafrans. Information reaching the desk of the Family Writers Press has it that dozens of armed Nigerian police officers and their counterparts in the Nigerian army were drafted in on the request of the ECA which was ably supported by the Enugu state Governor - Ifeanyi Ugwuanyi, to further decimate Biafrans who stormed the ECA conference venue, Universal Hotel, Enugu, on peaceful protest and renouncing the purported restructuring mantra. 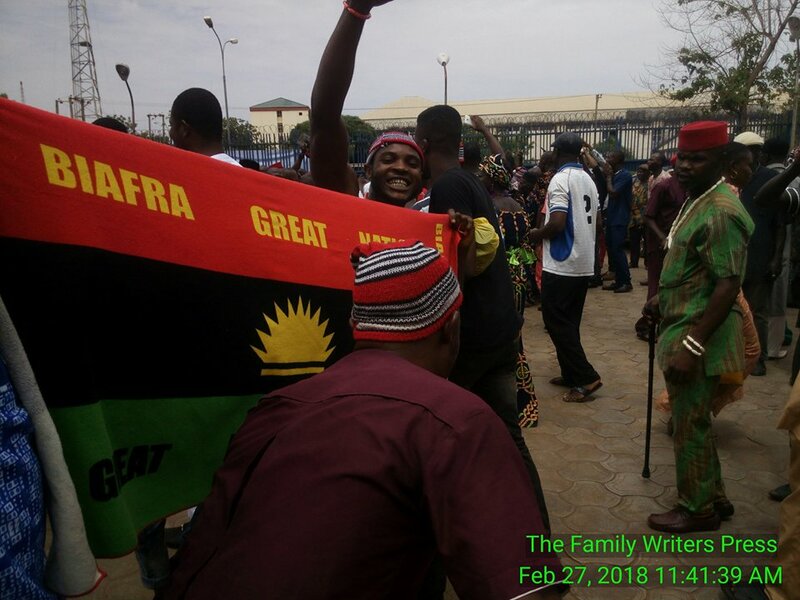 According to the Family Writers Press Correspondent covering the event, combined team of security operatives were sporadically shooting at the resilient crowd of Biafrans who stood opposed to the delusional restructuring agenda. They were courageously shouting for referendum and many have been reported injured. The vampiric Nigerian security operatives were spotted stopping and searching vehicles and tricycles in Enugu. I want to state emphatically here that Biafrans stand very strongly opposed to the restructuring or One Nigeria deceit being floated by the agents of the Nigerian government even in Biafraland. The government of the impostor (Jubrin from Sudan) called Buhari is full of evil and death. What Biafrans need is referendum that will usher in total and unfettered freedom even to the upcoming generations. There is absolutely nothing else besides this quest. Intimidation, illegal incarceration/abduction and killing, cannot and will never debar us from pressing home our inalienable right for existence as a people. *This cause must never be truncated by any mortal !